I know. Kale (unless it’s in juice form) is, like, so 2012, but I still can’t get enough of it. You know what else I can’t get enough of? Recipes that deliver huge, tasty results with minimal effort. Recipes that are endlessly versatile. Meals that taste like they took hours but require only 30 minutes of popping in and out of the kitchen. 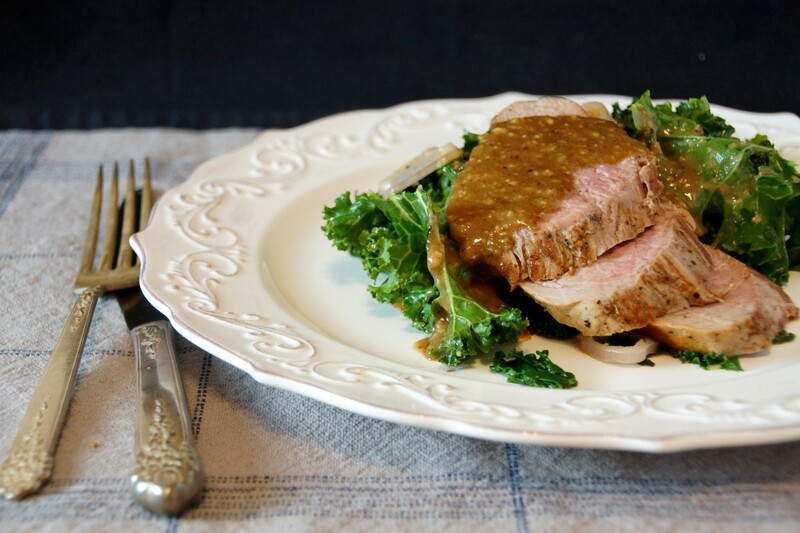 I can’t get enough dinners like this roasted pork tenderloin over wilted kale. 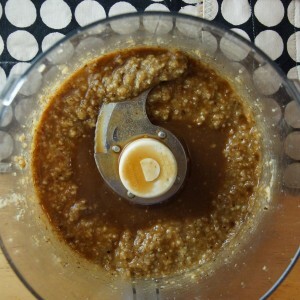 And the maple, Dijon mustard & walnut vinaigrette that dresses the dish? Would things get weird if I told you I wouldn’t mind bathing in it? You’re right, forget I mentioned it. 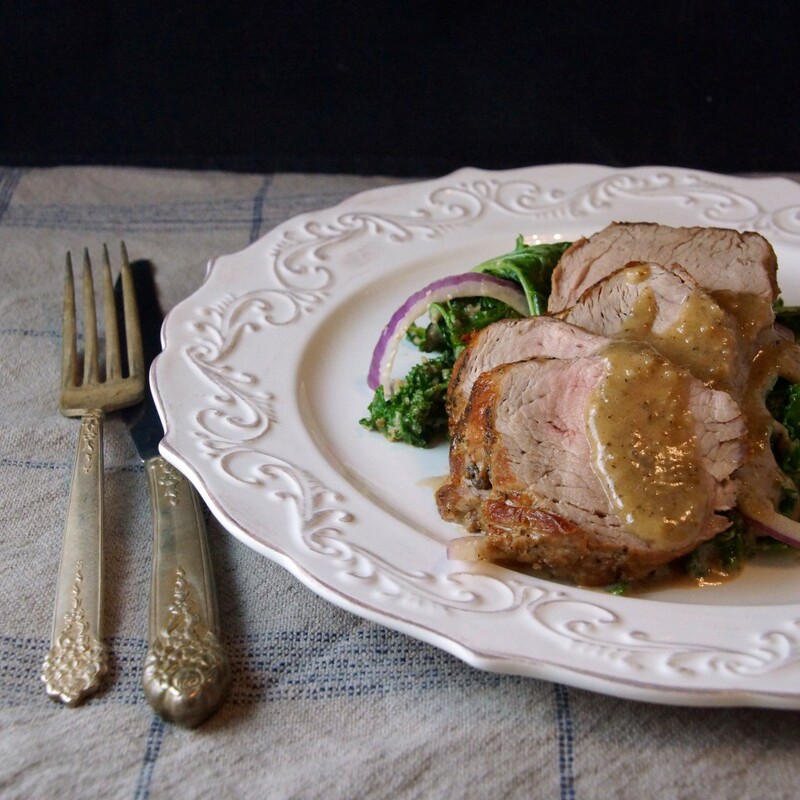 This pork is the latest incarnation of a recipe I found on epicurious years ago. The original recipe is a little lighter in flavor and is quite is good, any time of year. I’ve winterized it in this riff, replaced the arugula with hearty kale and bulked up the vinaigrette with maple syrup, dijon mustard, and walnut oil. 30 minutes, start to finish. Season and sear the pork. Get it in the oven while you rinse the greens and prep your vinaigrette. Pulse a handful of toasted walnuts with a couple cloves of garlic. Add a hefty spoonful of spicy dijon and a generous drizzle of maple syrup. When the pork emerges from the oven in a mere 12-15 minutes, let it rest while you finish the dressing job. Pour red wine vinegar into the pork pan, scrap up all the porky bits, and add it to the mix in the food processor. 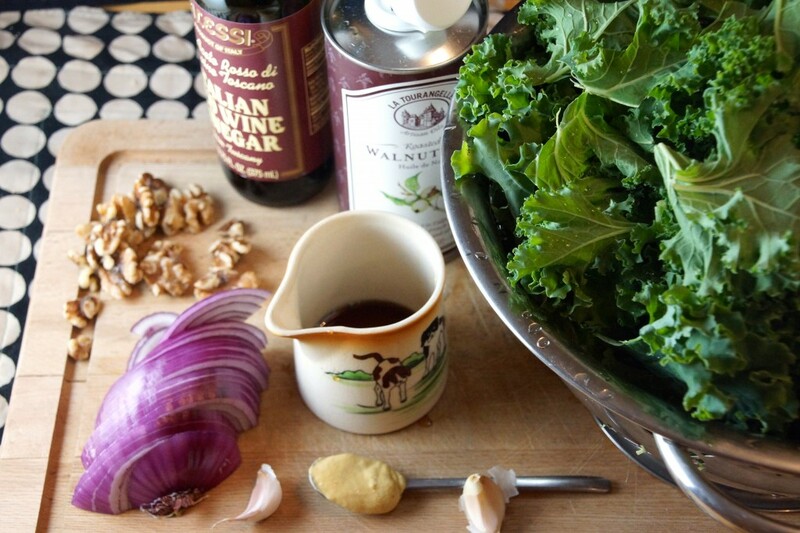 Walnut oil is drizzled in to create a most magical vinaigrette. Almost there. Wilt and dress the greens, slice the pork, plate it up. This recipe is open to many adaptations. Try it with a variety of greens (arugula, frisee, or chard would all be good) or switch things up with pecans or almonds. Pat pork tenderloin dry with paper towels and season with salt and pepper. Heat about a Tbsp. 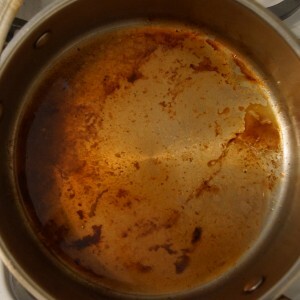 of olive oil in an oven-proof skillet over high heat. When the oil is shimmering, add pork and brown on all sides, 5-6 minutes. Transfer to oven and roast until internal temperature reaches 135° (pork will continue to cook after it is removed from the oven), 12-15 minutes. Place pork on cutting board and tent with foil, reserve skillet. Meanwhile, pour vinegar into the skillet (careful-the handle is HOT!) and boil briefly, scraping up all the small pork bits. 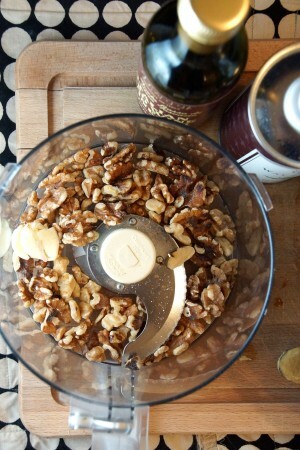 In a food processor, combine toasted walnuts with garlic and pulse into small, coarse pieces. Add mustard and maple syrup, combine. Add hot vinegar and combine. 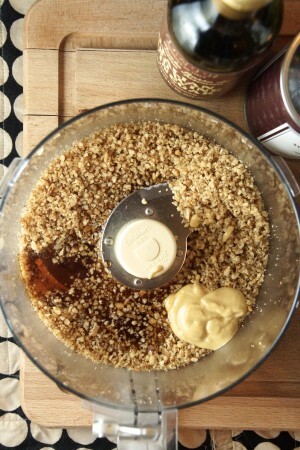 With the motor running, slowly add the walnut oil and process until the dressing has emulsified. Add the kale to the skillet along with a Tbsp. or 2 of water and wilt over medium heat for 30 seconds to 1 minute. Toss with the sliced red onion and about half of the walnut vinaigrette. Slice the rested pork. 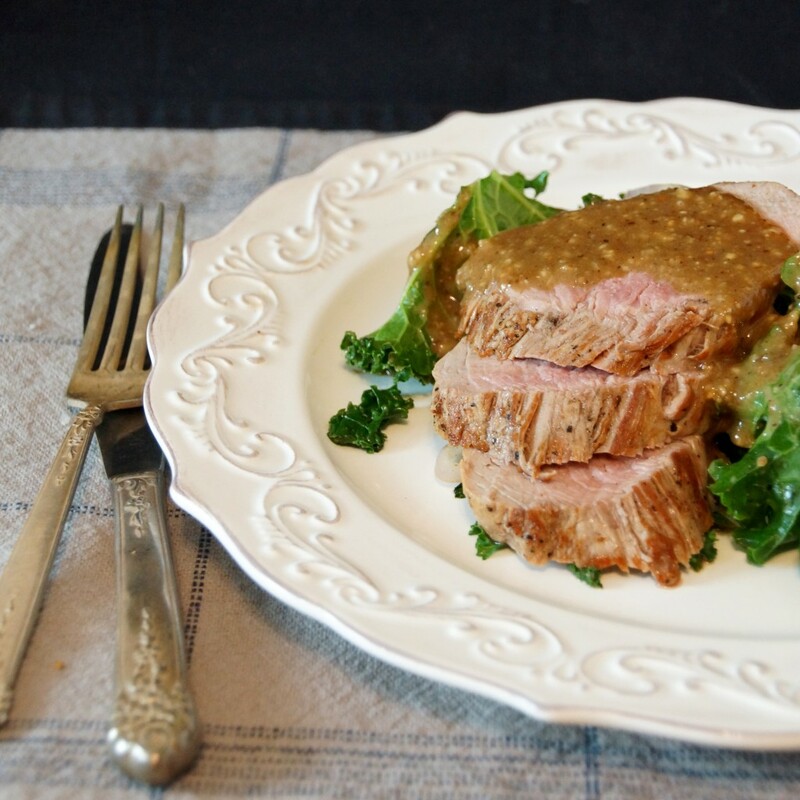 Divide the greens between plates and top with slices of pork. Drizzle with remaining dressing. Ah yes, this was a very memorable, delicious meal I recall eating on someone’s gazebo years ago! 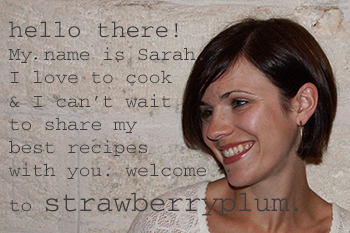 Now that I have the recipe, maybe I can get it right next time I try it! Thanks! I knew you’d remember that! Tastes even better without crazy dogs in the background.